Our mission is to inspire appreciation and stewardship of orcas, other marine mammals and the marine environment by identifying a network of viewing sites along the whales’ trails through the Salish Sea and along the Pacific Coast. The Whale Trail is a series of sites where you can view orcas and other marine mammals from shore. From 16 inaugural sites in Washington state, there are now more than 100, spanning the west coast from California to British Columbia. Through our sites and signs we are reach more than 30 million people each year. Our Mission: To inspire appreciation and stewardship of whales and other marine mammals and our marine environment. Our overarching goal is to ensure the southern resident orcas recover from the threat of extinction. Our vision is a fully recovered orca population thriving in healthy seas. From 16 inaugural sites in Washington state, there are now more than 100, spanning the west coast from California to British Columbia. 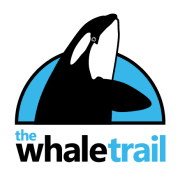 Would you recommend The Whale Trail?